Catch Up® Accredited Trainer Kath John met subject leaders and teachers who were very interested in the impact of Catch Up Literacy, as well as our Regional Training Centres in Sheffield and Leeds. Catch Up® Accredited Trainer Janet Sykes met Literacy Coordinators and teachers to talk about the Catch Up Literacy intervention. Many teachers were interested in how Catch Up® Literacy demonstrates effective use of Pupil Premium funding. Catch Up® Accredited Trainer Kath John met Maths leaders, Assistant Heads and Deputy Heads to talk to them about the Catch Up® Numeracy intervention and our local Regional Training Centre in Leeds. The event was very useful as many teachers had concerns about the limited interventions available for numeracy. 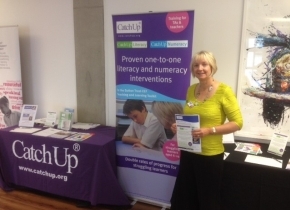 Catch Up® Accredited Trainer Lynne Startin met Headteachers and Deputy Headteachers to talk to them about Catch Up® Literacy and Catch Up® Numeracy. One particular area of interest was how often Catch Up is delivered to learners in school each week. Catch Up® Accredited Trainer Janet Sykes met Headteachers and Senior Management to talk about the work we do with teaching assistants. Some delegates were interested to know what age range Catch Up® is suitable for and what resources are needed, as well as finding out about the local Regional Training Centre in Leeds. Look out for a list of events we will be attending next term, where you can come and visit us on the Catch Up® stand to ask us any questions you have about Catch Up® and pick up more information about how we can support you to help your struggling learners.